On Saturday, Jylisa Williams led Oberhausen to a surprise 69-66 win over Keltern in a game between teams at opposite ends of the standings. Herner tried to get closer to the teams at the top as they beat Chemnitz 68-64. Shay Selby led Rotenburg to a 71-68 win over Donau-Ries to keep the gap between the top set of teams with the lower portion of the standings. Freiburg heaped more misery on Osnabruck even though Jasmine Thomas scored more points than any other player in the round. On Sunday, Marburg helped create separation between the teams with winning records and the ones looking to even up their records with an 85-71 win over Halle. Wasserburg continues to dominate as they moved their lead to three games over Saarlouis and the rest of the chase pack with a 72-61 win. 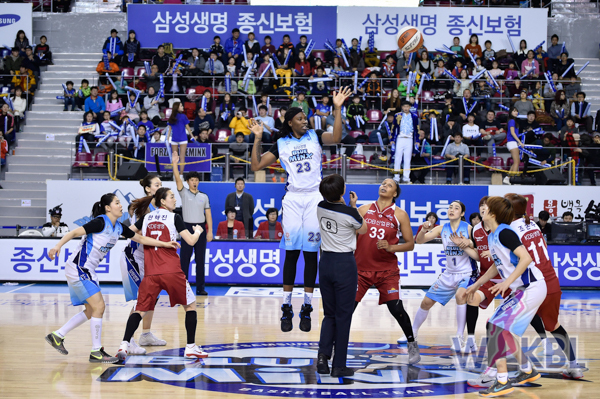 KB Stars won a thriller at home handing Shinhan Bank their fourth loss in a row, knocking them to third place in the standings for the time being. On Monday, Samsung knocked off KEB Hana by one point after Amber Harris made two miraculous three pointers to win the game. Woori took home another win beating KB Stars at home. In what was a close first half, Woori came out at halftime and took control of the game. After winning two games in a row Samsung didn’t show up for their matchup against last placed KDB. Although the final score was close, KDB was up by more than 20 points at one point in the game. Shinhan closed the fourth round losing every game after their defeat to Hana Bank on Friday night. The fourth round ended with KB Stars, Shinhan Bank and Samsung having the same 9-11 record. Worri Bank took care of business as usual defeated last placed KDB on their home floor finishing the round with the league’s best record of 19-2 and only a few games away from clinching a playoff spot with three rounds to go.